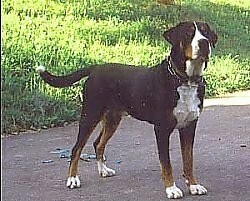 The Greater Swiss Mountain Dog is large, sturdy and muscular. The skull is flat and broad, with a slight stop. The backskull and blunt muzzle are about the same length. The teeth meet in a scissors bite. The nose and lips are black. The medium-sized, almond-shaped eyes vary from hazel to chestnut in color. The medium-sized ears are triangular in shape, slightly rounded at the tip and hang close to the head. The topline is level. The front legs are straight. The feed are round and compact. The chest is deep and broad. The tail is thicker at the base, tapering to a point and reaching to the hocks. Dewclaws are sometimes removed. The double coat has a dense outer coat of about 1 - 1 1/4 to 2 inches (3-5 cm) long. The undercoat is thick. The tricolor coat has a black base with specific rust and white markings. 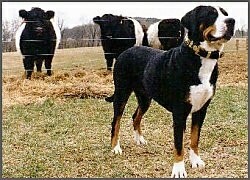 Symmetrical markings are preferred by breeders. Rust markings appear in a spot over each eye, on the cheeks and on either side of the chest. White appears as a blaze on the muzzle, on the chest, and on the tip of the tail. There may be a white collar or patches of white on the neck. 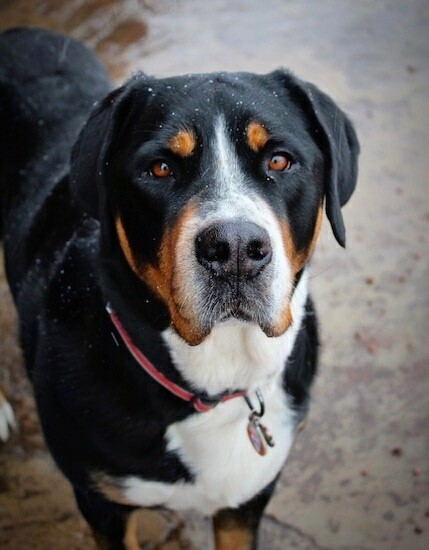 The Greater Swiss Mountain Dog is willing and eager to please. It is excellent with children, devoted, sweet and easy-going, generally good with other pets and is not dog aggressive. Teach it not to chase. It is Cautious and protective of the home. The Swissy warms up quickly to welcomed newcomers. An admirable, courageous, keen watchdog who will bark if it hears something out of the ordinary. The Greater Swiss Mountain Dog will not be happy confined to kennel life, preferring its family. This giant breed matures slowly in both mind and body, taking anywhere from 2 - 3 years to do so. The objective in training this dog is to achieve pack leader status. It is a natural instinct for a dog to have an order in its pack. When we humans live with dogs, we become their pack. The entire pack cooperates under a single leader. Lines are clearly defined and rules are set. 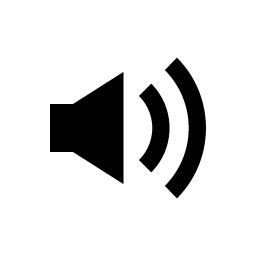 Because a dog communicates his displeasure with growling and eventually biting, all other humans MUST be higher up in the order than the dog. The humans must be the ones making the decisions, not the dogs. That is the only way your relationship with your dog can be a complete success. Prone to bloat, epilepsy, digestive disorders, hip dysplasia and distichiasis (extra eyelashes). They will do okay in an apartment if sufficiently exercised. They prefer cool climates. A small yard is sufficient. Moderate exercise is needed, however they do need to be taken on a daily, long walk, where the dog is made to heel beside or behind the person holding the lead, never in front, as instinct tells a dog the leader leads the way, and that leader needs to be the human. An easy-groom dog. Regular brushing will do. This breed is an average shedder. 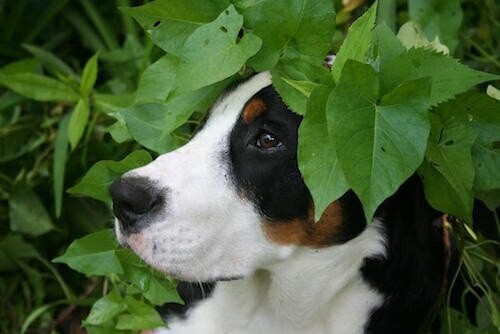 The Greater Swiss Mountain Dog was developed in the Alps of Switzerland, descending from the Roman Mastiffs, brought to the area more than 2000 years ago. 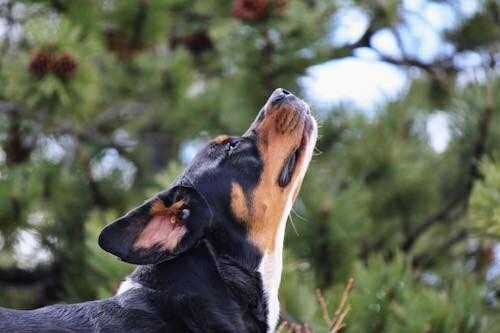 The largest and oldest of the four Sennenhund Breeds, which include the Bernese Mountain Dog, Appenzell Cattle Dog and the Entlebuch Cattle Dog. All four of these dogs have the same colors and markings but are different sizes. Used as draft dogs, guarding and herding livestock and as a farm sentinel, their popularity as a draft dog led to the nickname, "the poor man's horse." 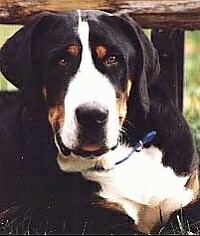 The Greater Swiss Mountain Dog may have contributed to the development of the St. Bernard. The breed almost became extinct in the late 1900s as machines and other breeds replaced the dogs in their work. 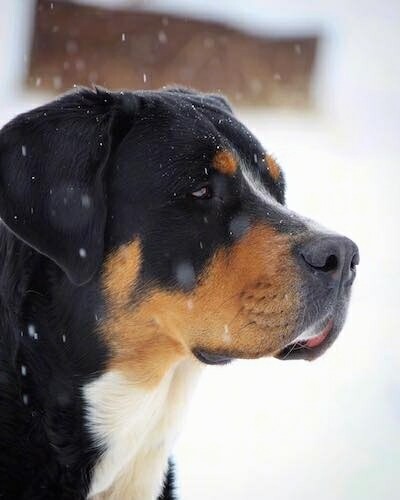 Dr. Albert Heim, who was an expert of the Sennenhund breeds, rediscovered the Greater Swiss Mountain Dog in 1908 while he was judging a dog show, and began to encourage breeders to take interest in them. His efforts resulted in the re-establishment of the breed. The GSMDs were first imported to the USA in 1967, but are still rare even in Switzerland. They were first recognized by the AKC in 1995. The GSMD's talents are tracking, watchdog, guarding, carting and competitive obedience. 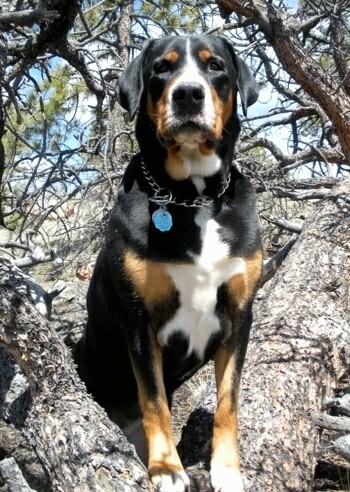 Kasey is a Greater Swiss Mountain Dog shown here at 3 years old. She loves spending time with family and going for long walks. 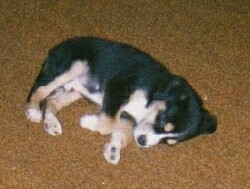 This is Wishbone the Greater Swiss Mountain Dog puppy at 3 months old. 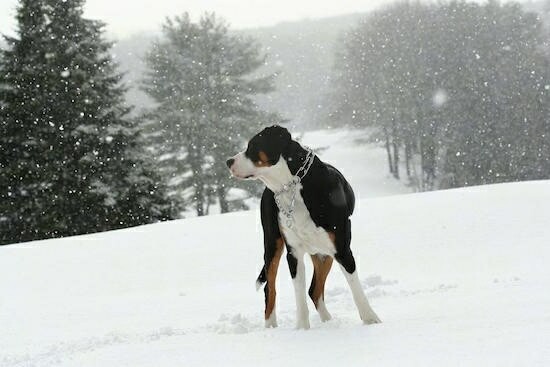 Everest the Greater Swiss Mountain Dog at 2 years old—"This photo was taken in York, Maine, on a golf course during the winter, which is Everest favorite season. In this photo he was about 2 years old. He is very protective over his family if new people enter the house, but warms up quickly once there is no threat. He's very well trained and such a great dog. Everest remembers many people, even after a year of not seeing one of our friends he knew exactly who it was. He is in great shape, very balanced and shows everything from his energy, caring, love he receives and gives and how family oriented he really is. My father is planning on retiring and after a lifetime of Labs, he loves Everest so much, his temperament and everything about him, that he plans on getting a few Swiss Mountain Dogs as soon as he retires. My father has had a few heart attacks in the past, and since Everest has come into our lives, he as well as the rest of our family, have become less stressed, and happier, especially my father who looks forward to 6:00 PM when Everest is allowed on the beach each and every day." 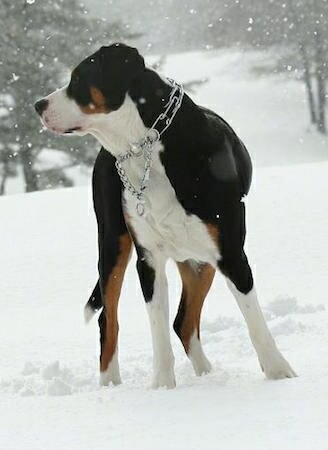 Everest the Greater Swiss Mountain Dog at 2 years old out on the golf corse in the winter.